While Democrats focus on sexual assault allegations against Supreme Court nominee Brett Kavanaugh, Karen Monahan is once again speaking out about abuse she says she experienced in her relationship with Keith Ellison, a congressman from Minnesota and the state’s Democratic candidate for attorney general. The note, dated November 2017, says that Monahan “states that she was in a very stressful environment for years, emotional and physical abuse” by Ellison. The Minnesota Star-Tribune, which reported on the document last week, received an email from Health Partners stating they were unable to confirm the document’s veracity “because it would violate patient privacy rules.” Neither Monahan or Ellison immediately replied to Jezebel’s request for comment. Monahan is the second woman to say she was abused by Ellison. The Star-Tribune reports that in 2005, he sought a restraining order against Amy Alexander for harassing phone calls. 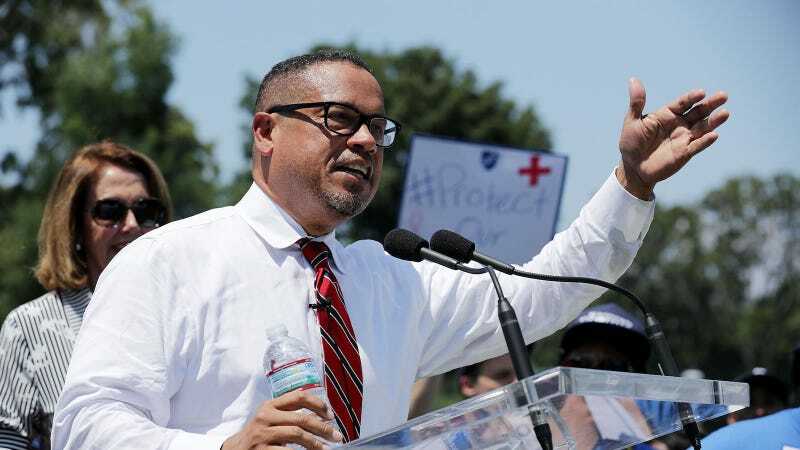 Alexander then requested a restraining order against Ellison, “writing in an affidavit that they had been in a romantic relationship and that he pushed, shoved and verbally abused her, and had a lawyer intimidate and threaten her.” Alexander’s request was dismissed.